Keep Performance Of Your Betting Picks! “Betting Manager” is a single tool with a built-in calculator, easy for anyone to use, that helps to manage your betting accounts. It’s not just an account manager. Using a little management secret (system), helps to raise your profits. Here you will see what made us to construct this tool and how you are going to use it and help your betting accounts. A tool that helps everyone who uses any kind of method, system or betting strategy, to avoid betting mistakes and calculate the profits perfectly. 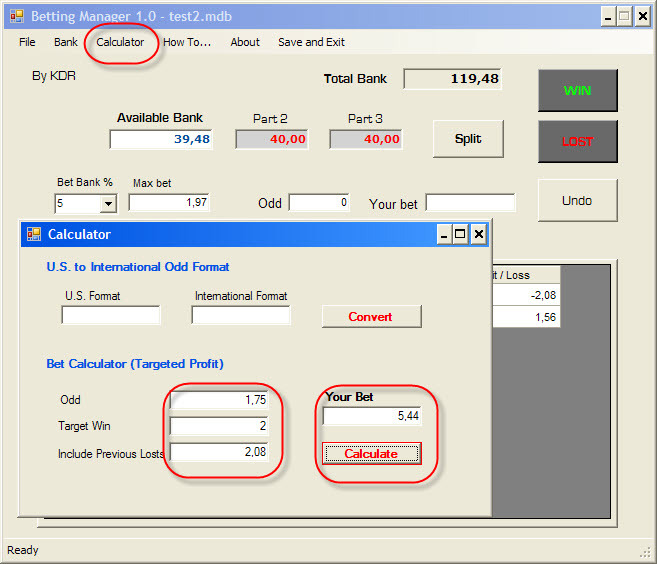 Are you using flat betting, or martingale? How agressive is your system? How do you protect your bank from high stakes that a betting strategy proposes? Here, you are going to take all the answers you need. Just using your everyday application and tracking your betting picks. The application is based on a smart system of managing your betting account. Split your betting account in 3 parts and work only with the 1st part. And why you call this smart? Because whatever happen, you risk only the 1/3 of your betting account. So you may earn a lot of money, but you have to manage your account with discipline. You will succeed if you have a method, and manage everything with discipline. Let’s assume that we have a betting account in a betting website and you have 120$ in that account. The first thing you have to do is to deposit in the application’s bank 120$ to a new file account and start synchronize your bettings to the application. Before your first betting, split your account and work only with the 1/3 of it, the “Available Bank“. Sometimes it is better to know how much money you may bet depending your bank. Keep your discipline by betting no more than 5% of your available bank. There is a list of choices at the “Bet Bank %” for you to follow. Depending on your choice and your available bank, the application proposes to you the maximum bet you may put. This is great if you do flat betting. We change the “Bet Bank %” to 5% and the application proposes us to bet 2$. Our odd choice is 1.78. Let’s assume that we win. We press the WIN button and we have the next screenshot. We have profit 1.56$ and is all available. Whenever we reach a target we planned, we can split again our bank. Now let’s bet to an odd of 1.66 the next max proposed bet of 2.08$ and lose. Now we are going to use the built-in calculator to calculate our next bet. This works perfectly if we use methods or strategies that can return all or a part of our previous lost bets. As you see above, we found a game to bet on 1.75, and we want to take back our 2.08$ previous losts, and earn 2$ more as a target win. The application proposes to bet 5.44$. Let’s assume that we win. By pressing the “Undo” Button, we can undo our last action. You see that we won 2$ and all the previous losts. We bet 10$, at 1.85 and we win. Now we press the “Split” Button. We may have less available bank, but a bigger part of our total bank is now safe from risk to lose. 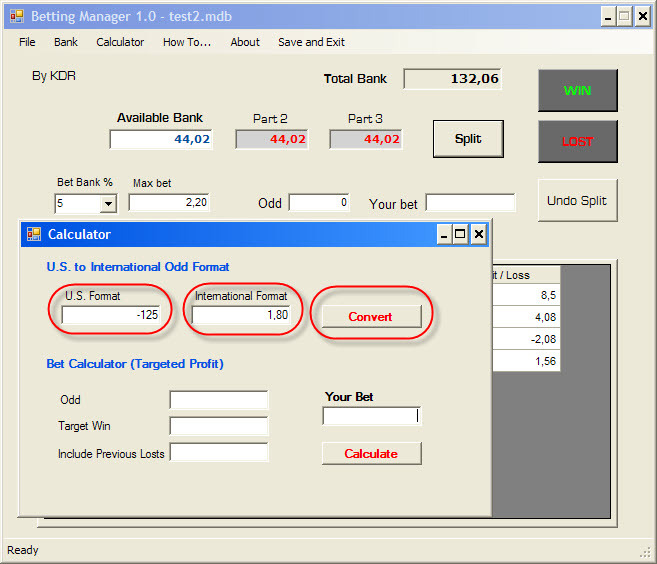 For those who bet in U.S, there is a converter in the built-in calculator that converts the U.S Odd Format to the International Format. Betting Manager is a single everyday tool that can manage and discipline your bettings using a safe system. A safe system that can save your total bank from a losing streak. Explore the Betting Strategies and learn how to make money using statistics. We don’t care about the odds. We care about statistics. We read the possibilities and we taking advantage of them. People out there make money? Maybe it’s your turn. With the use of Betting Manager and a strategy make your first step. Take a look to the “Bet Tip of the Day” and see our results. Buy now your personal serial number below. Copyright © 2014 – 2018 http://www.mybettingmanager.com All Rights Reserved.